Rave 200 Eclipse – Is it worth of it? When summer sets in, it`s time for family fun. Choice leads you to a water trampoline. 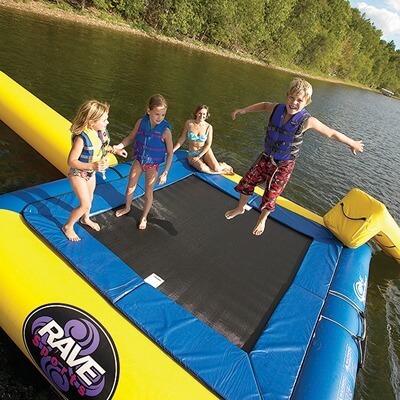 RAVE Aqua Jump Trampoline has a one awe inspiring trampoline for you, the Eclipse 200. 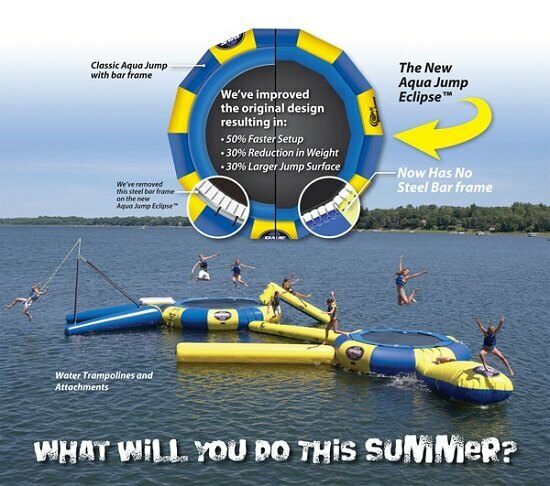 With years of expertise in water trampoline, Rave Aqua places lots of innovation in their Eclipse models. Rave Eclipse 200 is a unique model with the heavy frames made of steel eliminated. The landing pad is waterproof, while the balloon sides are made of high grade seams fuse d with UV heat. The landing surface is thus soft and enjoyable. The Eclipse 200 has no steel frame. This has ensured a large jumping plane. It is also very easy to set up. As it is very light this eases carrying by over 30%. All material on the Eclipse 200 is high grade and enormous skill has been placed on it`s design! Eclipse 200, like all Eclipse models, comes with a Rave inflator. It also comes with gear for anchor attachment. It doesn`t get any better than obtaining a Lifetime service contract. Eclipse 200 also has optional storage controls. The Eclipse 200 is also easy to board since it s fitted with an easy to grip steel ladder. It`s size for inflation is 227 inches of diameter by 36 inches. The eclipse 200 weights approximately 185 lbs. Has a stainless steel, easy grip ladder with 5 steps. It has a 20 ft diameter of bounce pad. Is designed like a polygon and has 14 sides. Each inflated tube is manufactured from high grade vinyl heat fused seams. The tube material is resistant to mold. Each Eclipse 200 can play host to 3 bouncing adults or a whooping six children. The eclipse has a slide log and rope swing attached. It also has room for an Aqua branded log, launch and slide walk. Rave Eclipse 200, no matter the huge size is easy to inflate and only demand s a maximum of 50 minutes to set up. Water required for this piece of art is above10 feet. You are free to bounce your life on this Eclipse 200 because you are sure of it having a lifetime warranty and build to perfection. Eclipse needs 75-125 lbs. of weight to anchor and has handles on ladder top for easy boarding. Eclipse 200 is made the best and with the finest commercial grade material that makes it last long. It&#x2019;s pleasing and satisfying to use. Has no steel framing which makes the landing pad supple. The absence of steel frames also makes it light for carrying into and out of the waters. It has a large landing pad that allows for many people. 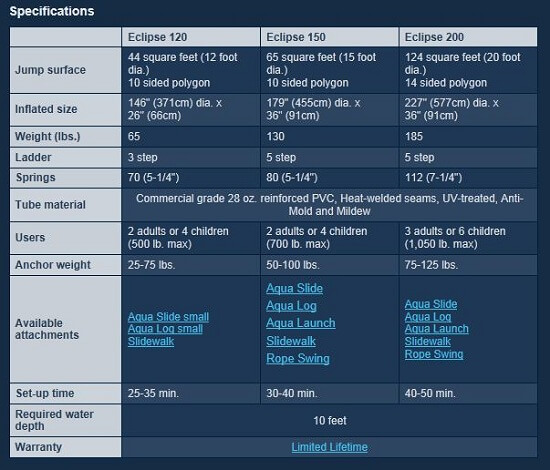 Eclipse 200 also, is very easy to set up. 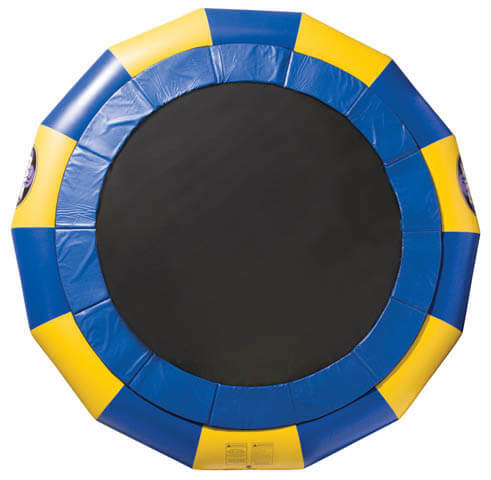 It also has its own inflation and deflation gear that makes it easy to inflate the trampoline. It is easy to board due to its easy to grip ladder that has steps. Has a mold resistant material which removes the scare of storing it before it&#x2019;s well dried. The Eclipse 200 can be fitted with the Aqua Launch that increases the height of bounce. This adds fun and pomp to the jump. 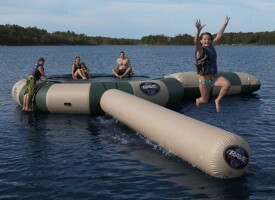 Due to its being used in water it has a low jump compared to land trampolines. They need proper inflation to perform the right jump. This eliminates the fact of enjoyment if the aeration level reduces. The firmness to be achieved for proper performance makes the tube hard and reducing the comfort. Most accessories that add user comfort and enjoyment are bought separately making it costly to build the Eclipse to perfection. The Rave Eclipse 200 is lord of family fun in a unique way. It`s easy to setup which is a plus. Light to carry. I love the addition of kits for inflation which are special to the needs of Rave equipment. It has a large landing surface which creates room for family and friends to enjoy. The aspect of bouncing, fun and enjoyment is medicine to the heart, therapy to the growth of the mind and also builds social ties. The Eclipse 200 does all this in an special way like no other. 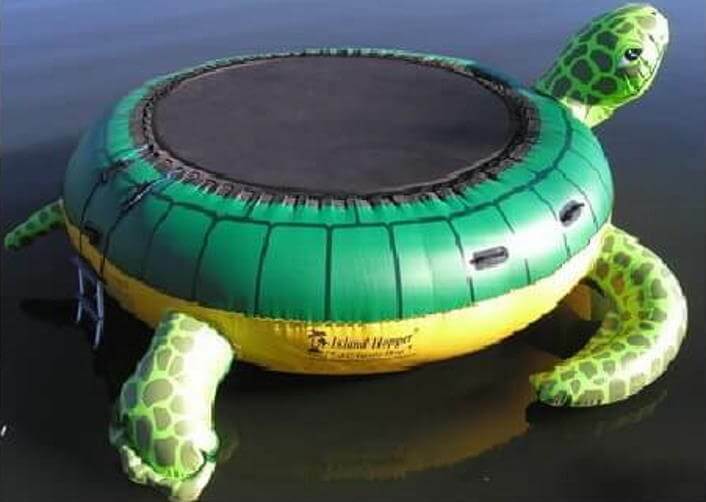 Very good water trampoline for use by 6 children or 3 adults. High price makes it a luxury product which not all can afford! 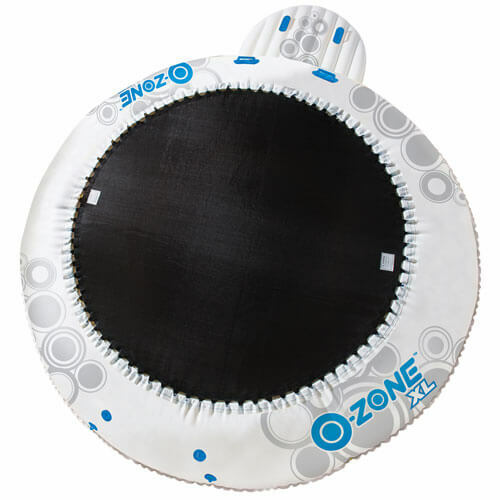 Rave O-Zone 5-foot Water Trampoline; Cheap or not quite?